Summer solstice is just two hours away. It officially hits this coast at 9:24 pm Pacific Time. 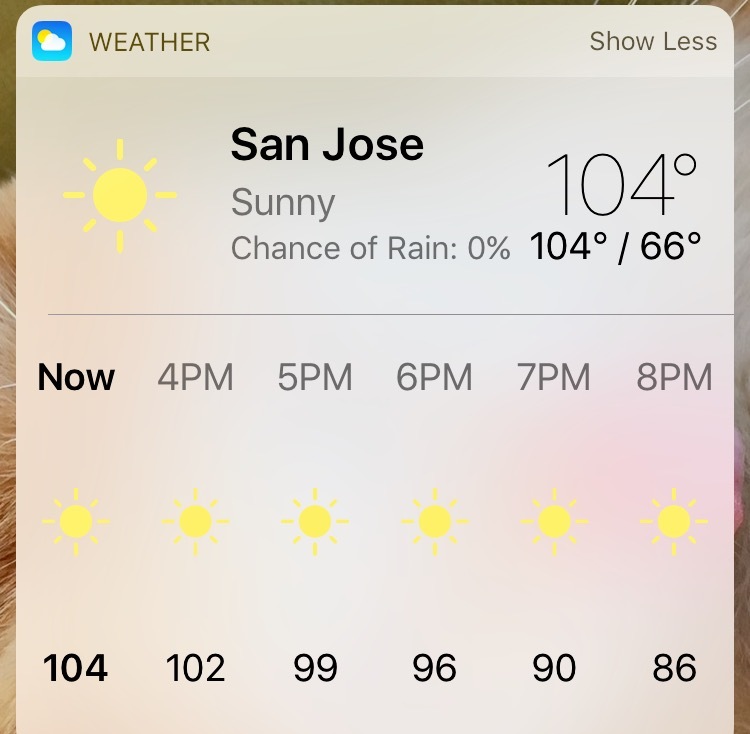 Unfortunately, a brutal heat wave arrived over the weekend, ushering in summer in San Jose with a three-digit preview: 104 F (40C). We don’t have central air conditioning at home, so one day we escaped for a few hours to a mediocre movie, just for the excuse to sit in a cool theater for a few hours. All three kitties dragged themselves around the house from spot to spot to benefit from the ceiling fans and the cool tile floor. The heat really crept up on us. In the past, heatwaves lasted for three days, then cooler temperatures prevailed. This week, however, it’s going back up again, expecting to peak at 101 F on Thursday. They’ve called a heat advisory along with a request to turn off all unnecessary appliances between noon and 9 for fear of over-stressing the grid. Good times! I added ice cubes to one of the bird baths, and we’re keeping the other one topped up with rain water from the tanks. I halfheartedly pulled a few weeds that stubbornly grow between the ground cover making them hard to reach. Every time I hear them snap, I know they’ll be back the following week. Honestly, though, it’s just unbearable to be outdoors for long. My peace garden is in terrible shape. Even with extra watering the baby tears turned brown. What a sorry sight. What’s up with the weather in your neighborhood? For my southern hemisphere friends, you’ve reached the shortest day of the year. It’s all up hill from here. The Summer Solstice is Upon Us: Check out the gorgeous graphics and photos in this article. My favorites are the mobile pics at Stonehenge and the rainbow map of North America. This entry was posted in Gardening and tagged California Heat Wave, California weather, Heat Advisory, San Jose Heat wave, Too hot. Bookmark the permalink. I am so sorry you are trying to endure that heat without AC. I could not do it. I would be checking into a hotel to get some sleep. We are going into the high 90’s this weekend but then cooling down again before the next one. July 4 should be bearable. I run the fan on my central AC unit full time so the AC doesn’t have to come on nearly so often. Then I take lots of quick warmish showers. You actually cool down better with a slightly warm shower than a cold one. Turn the water on, get in, get out, air dry. 🙂 I need to make some of those bag dresses that I can toss on to stay cool in. I have nothing for summer. The pattern and fabric are waiting along with 40 other things that need doing. When it gets warm, the sewing room gets the most heat. I’ll be out at 5:30 to water in the morning. By 7 or 8 it’s too warm out there already. But there is no global warming, right? What a dreadful heat to endure without aircon. As one who lives in a hot climate most of the time, I know you’re doing all the right things, but if you do get stuck on scorching nights and no power, the easiest way to get to sleep is under slightly dampened sheets, and if you can locate any of those gel mat cooling pet beds, sleeping on one of those is really nice! Thanks for the tips, Kate. I’m originally from Ontario, Canada and I have the skin of a northern girl, so being a California transplant means putting up with heat and sun that does not come naturally. My husband’s parents are from Argentina and Italy, so he tolerates the heat better and doesn’t burn like I do either. Are you from Australia originally? Perhaps… it’s dull today but since the weather can change so rapidly, who knows what we might get later on! Phew! That is brutal. We are in the 30s in my part of France at the moment and I am doing the very French thing of keeping the shutters closed all day and living in semi-gloom. I know the U.K. is having somewhat of a heatwave at the moment too (and one that’s lasted longer than two days this time 😉 ) so something odd is going on with the weather. As for having soup when it’s hot I’m not sure I could go for that but the same reasoning applies to drinking hot tea so that’s good 😉 Take care and keep cool! I just heard yesterday about the UK heatwave. That’s really uncommon there. It seems to be blanketing the globe. 30s is hot enough, so good for you staying in the “gloom” till the coast is clear. I still enjoy my hot tea at the end of the day, a tradition passed on by my British father. I hope your weather improves soon as well. Fortunately, it’s cold today (about 18 degrees C), so the curtains are open 😃. We might even get some rain, which sadly is predicted to fall just when it is the school sports day! Oh what a shame. So, did it rain on sports day or were you spared? Our rain is very often small, sporadic (i.e. insignificant) spots of water, so yes it did rain but not in a way that made you need a coat or shelter. We did need coats to keep warm, though! Ah, I know all about spotty rain. We get much the same for a good part of the year. But I suppose the weather forecast says ‘rain’? I smiled wryly on coming to your post Alys, I just put up my latest with a brief whine about how cold it is and the fact that I was feeling a little blah with some flu symptoms – working on a painting to loud music seems to have cured me 🙂 We have been enjoying a mostly benign early winter, but last night Jack Frost called for the first time and he was followed by a quite unnecessary blast of polar air from the Southern one…… Brrrrrrr! But oh dear, your heat is not nice! You can’t function in that. You are all forced to lie about in various states of undress, downing mint julips or something similar and fanning yourselves – or you could adopt some cooling habits from the Arabs – they don’t wear those long white thawbs just as a fashion statement. But please, don’t try sleeping on a pet gel mat – they heat up via your body heat and you end up baking – I tried it once 🙂 They are good to rest your bare feet on and do help cool you down briefly. If this is the new normal you may be forced to reconsider the air con thing, but as you say, power outages mean it doesn’t work any way. Polar air sounds just as brutal, especially when it hits suddenly. Some of the western airlines here are cancelling and delaying flights because the heated air is thinner and the tarmac hotter. It’s amazing how wide-stretching the heat can be. The same is true, when planes are covered with ice, though I believe they have a way of de-icing them before flight. I feel sorry for the cats wearing their hot fur coats, but at least they get to do the lying around the rest of us would like to do. Mouse prefers the floor of the garage which stays quite cool until about 5 pm. Tessa just collapses wherever she might be after playing, and Lindy retreats to our closet, also surprisingly cool. I’ve found relief from a warm bath or shower, and also simply splashing cool water on my face and neck. The native plants out back are thriving, but not so much in the front. We’ve had to replant an entire section. We’re upping the water this go around, as we now understand that they needed more water till established. If we had planted last November, all would have been well with all that rain, but since it was the year before, they didn’t get that boost…or so I’m guessing. Pauline, I’m delighted to hear that you’re back to your self. I’m sure it was the extra dancing that cured you. 🙂 It is amazing how quickly the garden conditions change. I think the sweet peas will always be on borrowed time, though Lisa says she can grow hers all summer, even though it’s also quite warm. I’m wondering if the humidity is what makes the difference? It just ticked up to 100 with 101 expected in an hour. Then tomorrow a high of 92 and finally back into the 80’s. Those same high temperatures can be reached up on our Central Plateau – which is why I never go there in the summer. We’ll pass through it on our way to Wanaka but it will be late in the season so you may experience it as relatively cool 🙂 On the plus side it is a wonderful fruit and wine growing region. Oh my gosh, Pauline, I’m so excited at all the wonderful things we’ll see, and at the prospect of spending so many days together. Hi Cathy. I’m stunned at the excess heat around the globe this month. I’m sorry, too, to hear that you have another week of it. You’re right about the car. I’ve been picking up my son from camp counseling this week,so I have the excuse to be in the car in the late afternoon, not to mention the pretty drive up the hill. I often see a dear grazing then too. Hang in there. Wishing you cool breezes as well. I can only imagine how wilted you must feel; be sure to stay hydrated. Our weather has ‘only’ gotten up to about 90 with the humidity but at least we have air conditioning. I was able to get into the garden day before yesterday to plant some succulents and it has been overrun by red spider mites. There must be millions of them – all over the patio, plants; I can’t even sit on a chair 😦 If anyone has ever dealt with a red spider mite infestation, I’d love to know how you dealt with it. Oh yuck, both to the heat and humidity, not to mention the red spider mites. I know ladybugs eat aphids, but I don’t know if they’ll eat spider mites. In the past I’ve had to get rid of the entire plant. Sometimes surrounding the plant with plastic for a short time can knock them back. Best of luck, Sara. UGH!! I’m wilting for you. I don’t like the heat but I hate the humid heat more. So where do I live, in Virginia. Welcome to humid heat. Not as bad as some places but it can get pretty yucky. The past few days have been hot and the dust and dander count is up so I suffer that way as well. Good grief Charlie Brown don’t you have anything nice to say. Yes, I do. Stay cool Alys, I hope you can find a nice film to see nice time, a pool to relax in, a cool drink to enjoy and maybe an ocean breeze. Take care friend. As you said, shorter days are all ahead. Thank you, Amy. I would wilt in a place like Virginia. I’ve spent time in Mexico and Hawaii during their more humid months, and honestly I don’t know how people cope. Here’s hoping that we all have cooler days ahead. Wow. That’s hot. I read about Phoenix, but did not know you were getting that heat as well–and no air!!! which I suppose in normal times, you don’t need. It’s so dry in California, the heat isn’t held in the air–for instance, there is a difference when you walk into the shade. Still, ugh. It’s going to be in the 90’s here tomorrow and humid of course, but I like that. My skin feels so much better. We’ve had a string of nice days–upper 80’s, low humidity (well, low for us; I imagine you would think it a bit damp). Do try to stay cool. I hope it passes so your garden doesn’t dry up. Lisa, I’m glad you enjoy the heat and the humidity. You are exactly where you need to be. Does your apartment have air conditioning? Arizona gets really hot, though it’s a dry heat. Still, once temps reach 118 I can’t imagine it’s comfortable for anyone other than reptiles. The lizards in our neighborhood love the heat, and spend time trying to sun themselves on the rocks while avoiding capture by Mouse the Cat. Poor little things. I’m glad I’m not in your locale – or my son’s, in Phoenix. We’re looking at forecasts of upper 80’s and dreading that. My husband does not handle heat well at all so he invested in a portable AC unit last year. My sewing room is also on the hottest end of the house and we do the window shade shuffle all day long in an effort to keep things comfortable. There will be more hand stitching than sewing that requires ironing during the hottest days. Sue, Phoenix is the winner by a mile when it comes to excessive heat. Poor guy. Given that it is a dry heat, it probably feels like a furnace when he’s out in it. I completely commiserate with your husband. Some of us just aren’t cut out for hot temperatures. My husband copes far better than I do. We too invested in a one room AC and it helps. We’ve put it into the living room where we can all stay cool. The fans help for most of the day, but by late afternoon/evening, it’s pretty hot. Hang in there! I’m going to say it again–I think I’d die in that heat–and I know some people have succumbed. It’s truly awful and truly scary because we just know it’s getting worse. We don’t have AC either but we also never have 100 degree heat! A small window unit for your bedroom? We invested in a small, portable AC which is in our living room. It’s not as efficient as a full system, but it’s definitely making at least one room bearable. The fans help move the air around, and the cats enjoy sitting underneath them, so they must be making a difference. The poor kitties with all that fur. I’m glad to hear that your temps remain in the manageable category. Is that because of your proximity to the lake? Being near the lake helps but mostly because it’s often breezy near water. We’re also near mountains but I think the cooler air is mostly because we’re pretty far north. And we pay the price in January! That all makes sense. And I have no doubt you pay the price in January. I’m glad you have that cozy little fireplace. I would find it hard to drag myself away. Thank you for that big hug. They’re my favorite. The heat broke after a week, and we’re enjoying reasonable temperatures once again. We even pulled up a blanket last night so that’s something. How are things with you? Heat stroke is a real thing, and a handy excuse as well, so feel free to keep that tucked in your back pocket for future use. 😉 I hope you’re having a good week. Oh no! Not wildfires!! I hope you’ll get some rain soon, Alys. And if not, I’ll send you a few gallons of ours … it keeps coming, even when the forecast promises sunny skies. The strangeness continues. It’s not pretty. 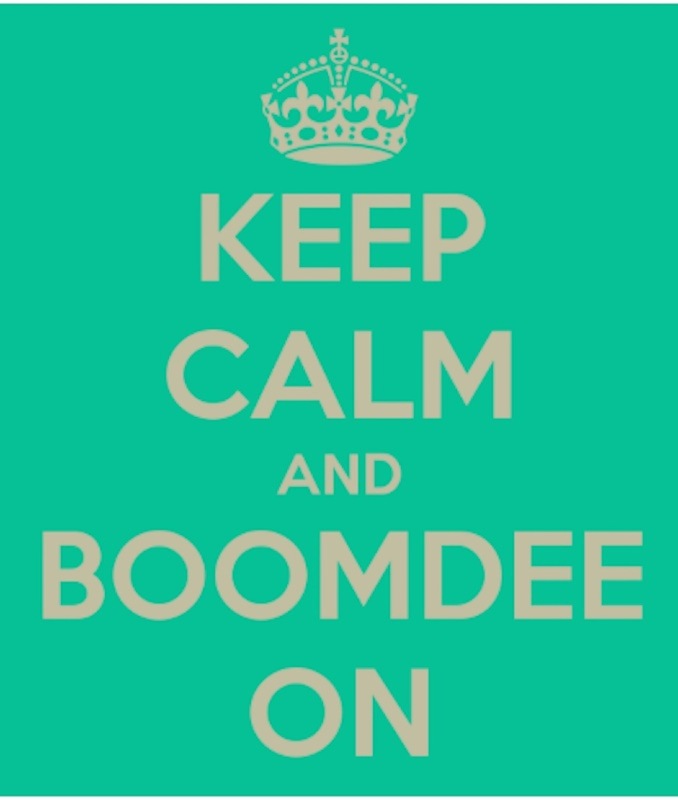 We have long, hot, smoggy days and average .08 inches of rain for the entire month of June, July and August. I’m so happy when we get that first rain. And here you are suffering from too much. Sigh. I hope the cool we are now experiencing will waft its way towards you, Alys. It’s actually a bit too cold again but at least I got my first decent night’s sleep in ages! Interesting article on the solstices. Helen, it’s cooler here too. I know exactly what you mean about sleeping better, too. It’s much easier to sleep in a cooler room, both winter and summer. Last night was delightful – rain made it darker as well 😊. I’m glad you’ve got cooler weather, Alys. Extremes seem to be the new norm. I’m always excited for days like today – sunshine, low humidity – they don’t happen often enough. Stay cool my friend. You too. Sunshine and low humidity sound perfect. I have never experienced temperatures that high – as you know, it hit the low thirties last week in the UK, which was pretty much unbearable given the humidity. No air conditioning meant it was miserable, especially at night. Summer temperatures are normally 18-24 degrees Celsius, the high humidity making that about as hot as is tolerable. You had a rough week there. Humidity makes the temperature feel so much hotter. I really feel for you. We’re back into the high 70s F this week, and even needed a blanket the last couple of nights. What a refreshing change. Let’s hope the rest of the summer is milder for both of us.